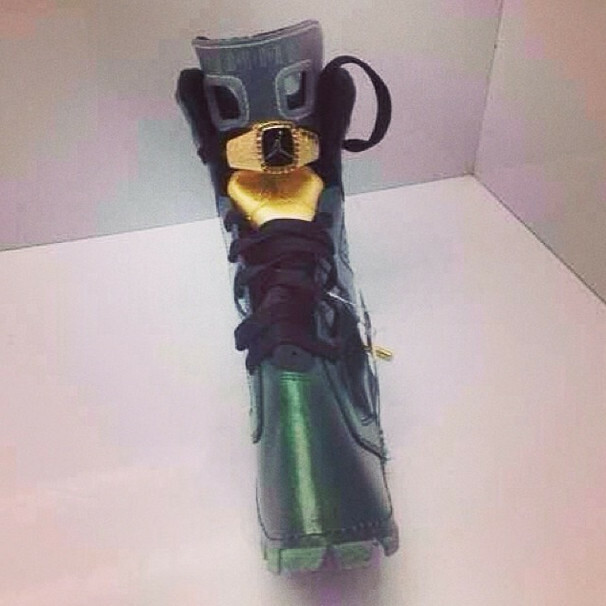 It may be early, but it looks like the next Ducks Air Jordan will be the 6. Over the past few years, we've seen U of O editions of the Air Jordan 3, 4 and most recently, the 5. So, if we were to put a bet on which model would be next to get a Ducks makeover, smart money would be on the Air Jordan 6. And if you did make that bet, it looks like you might be right, based on this image of a shoe that's so early in the production phase, it's not even really a "shoe" yet. But based on the green upper and yellow detailing, even if there aren't Duck feet on the heel, this one will probably be nicknamed the Oregon 6s anyway. It also looks like "Cigar" 6s aren't the only pair that will have the "Ring" lacelock. Check out the image below, and let us know what you think. Were you expecting the next Ducks Jordan to be the 6? Does it look like what you would have guessed?